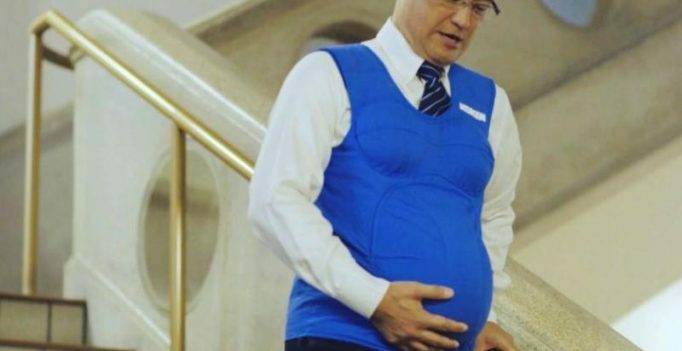 Tokyo, Japan: A trio of male Japanese politicians has gamely strapped on “pregnancy vests” that simulate swollen bellies in a lighthearted campaign for men to pick up the slack in a nation where women do most of the housework. Japanese men are not very helpful husbands when it comes to housework: they do just one hour of unpaid work daily compared to five hours for their wives, according to a 2014 study by the 35-nation Organisation for Economic Co-operation and Development. The three-minute spot, which started running last week, shows the hapless lawmakers being outfitted with seven kilogramme (16 pound) vests that mimic the belly of a woman who is about seven months pregnant. Then it is time to clumsily navigate stairs, carry groceries, or wait for someone to give up their seat on the bus. One politician struggles to put on socks, while another wipes sweat from his brow after hanging a load of laundry, as an upbeat tune plays in the background. “I can see how hard it is to be carrying a child and do house chores,” says 52-year-old Shunji Kono, the governor of Miyazaki prefecture. “I think I have to be much kinder,” the father of three adds in the video. Prime Minister Shinzo Abe has made drawing more women into the workforce a top priority to fix the economy, heeding calls to make better use of a highly educated but underemployed labour pool.